Though Africa is not always thought of as a family-friendly destination, it can most definitely be a fun, educational and safe place for children to visit. With many malaria-free areas, child-friendly accommodations and kid-oriented activities, not only is it a great place to bond as a family, but it can open a child’s eyes to the beauty of the natural world and the richness of other cultures. Imagine the wonder on your child’s face as she interacts with the habituated meerkats, gets drenched by the swirling mist at Victoria Falls, learns how to make African crafts, or dances with local children. These types of experiences are arguably better than anything they can read about in a textbook or see in a zoo, and definitely more enriching than spending hours buried in video games or social media! Most safari lodges in Africa offer shorter game drives, dedicated children centers, junior ranger programs and other activities guaranteed to suit the interests and attention spans of children of various ages. 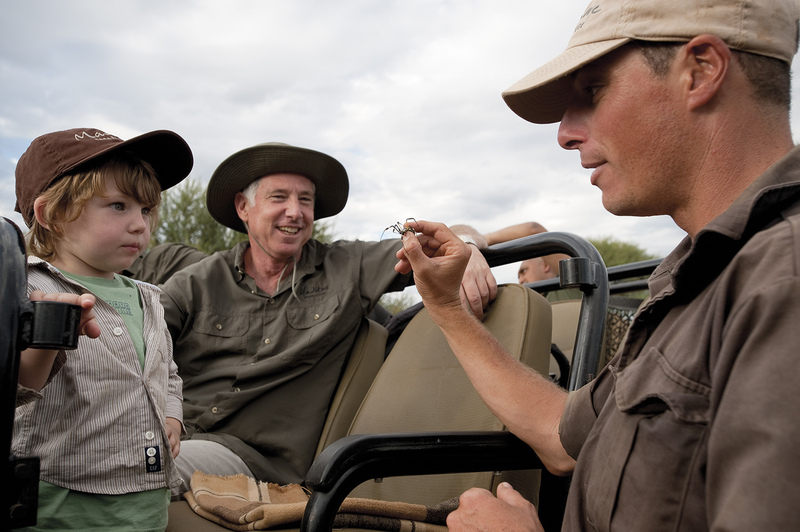 For example, at South Africa’s Madikwe Safari Lodge kids can learn about native insects during a “Bug CSI” class in the bush, paint their favorite animal on a rock that they collect during a game drive, or take part in a safari scavenger hunt. 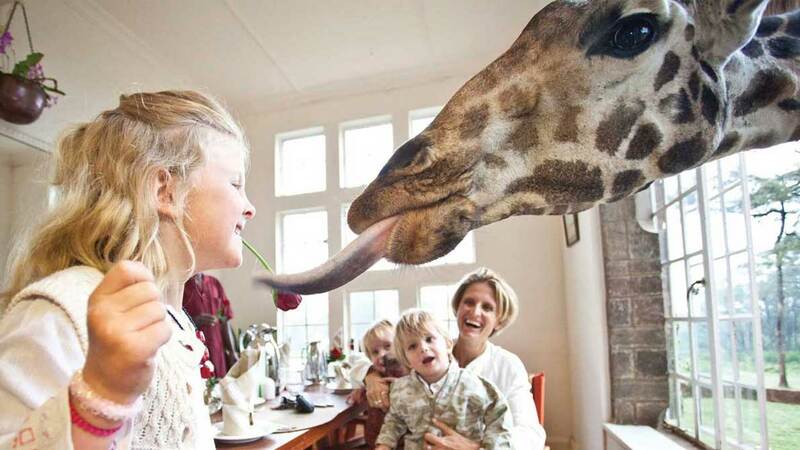 At Nairobi’s Giraffe Manor, children can hand-feed the gentle resident giraffes that roam the grounds, and learn about what’s being done to protect them at the adjacent Giraffe Centre. Most hotels also have inter-connected or multi-bedroom suites to accommodate families with children of different ages, and many also offer amenities like special menus, cookies at turn down, mini bath robes, and babysitting services. Booking early is the key; up to one year prior to travel date is the best time! All guests require a valid passport for this journey; valid 6 months after your date of return. The newly renovated Riverdene Family Lodge at Shamwari Private Game Reserve is an ideal place for families and where children can engage in the Kids on Safari program. 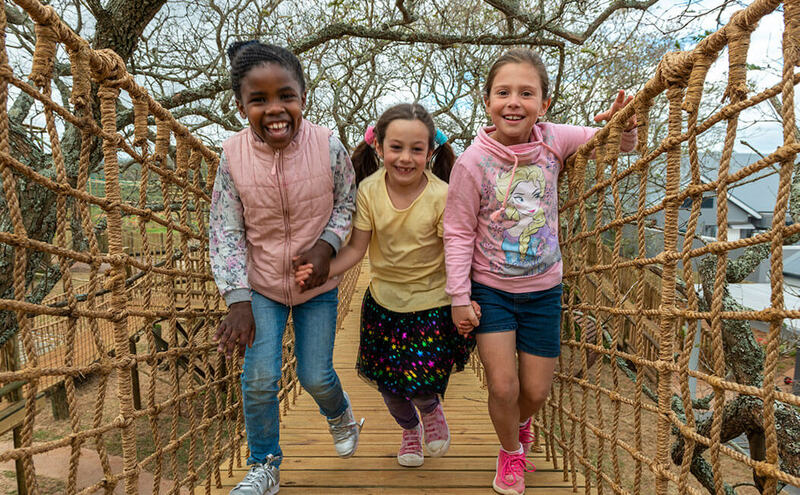 With access to both indoor and outdoor activities, kids can enjoy zip lining, arts and crafts activities, rock climbing walls and exploring the game reserve through a network of tree houses connected by suspended walkways. This unforgettable journey will transform you and your children forever. African Travel, Inc. offers numerous itineraries that are perfect for families with children, or that can be adapted to meet a family’s needs. These include some of our most popular trips in southern and eastern Africa: South African Tapestry, Best of Botswana with Victoria Falls, South Africa Natural Wonders, and Under Kenyan Skies. Donna Salerno Travel offers numerous itineraries that are perfect for families with children, or that can be adapted to meet your family’s needs. These include some of our popular trips in southern and eastern Africa, Ready to book your family trip to Africa &beyond? Give us a call to help create your best family trip ever!